Do you see anything wrong with this picture? 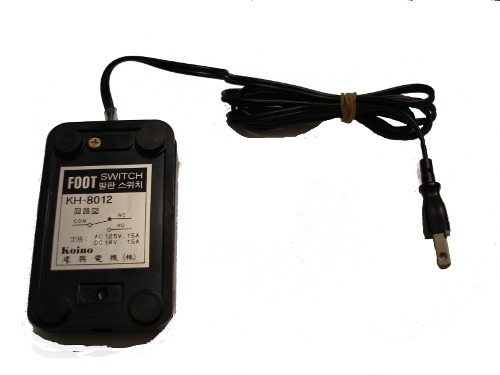 That is indeed a SPST foot switch with a NEMA 1-15 plug on the end. I can’t think of any reason that you would want to do that – the switch is rated at 15 A / 125 V AC (as well as 14 V DC), so it’s not like it was meant for a European destination where the corresponding socket wouldn’t be found in the wild. The label is a lie too – it’s normally open, and conducts when closed. It is not SPDT: there are only two conductors coming out of the switch. I’ve since rendered it safe and unable to short out household wiring by cutting off the NEMA 1-15 and adding a 1/4 inch jack instead. All I can find about this switch is that it’s available from China and Vietnam, and costs USD $6.49 each when bought in large lots. Any idea what this was originally used for, or why on earth anyone would want to terminate it in a way that seems designed to blow fuses? Leave a comment. You are currently browsing the Andrew's Memory Blog blog archives for December, 2014.